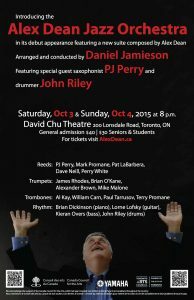 The Alex Dean Jazz Orchestra is proud to make its debut appearance with a new suite composed by Alex Dean, arranged and conducted by Daniel Jamieson and featuring special guest saxophonist PJ Perry and drummer John Riley, at the Humber College Lakeshore Campus on Oct. 3 and Oct. 4 at 8 p.m. The Juno and Grammy-winning Dean will be premiering his new big band, with a new, five movement big band composition. The piece honours five influential Toronto musicians: Bob Brough, Mike Malone, Paul Brodie, Archie Alleyne and Eugene Amaro. This tribute is funded in part by the Canada Council for the Arts and the Toronto Arts Council. Tickets for the show are $40 CAD general admission and $30 CAD for seniors and students.